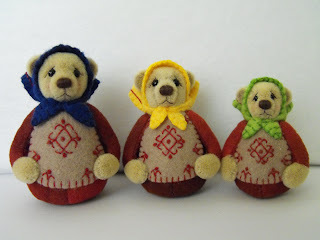 Parker Bears - Hand Made Miniature Artist Bears from Downunder: Babushka bears !! It has been on my to do list for a long time to make a set of Babushka bears. I just love the Babushka dolls especially the older more rustic ones. One of my friends has a few sets of quite old Russian dolls dressed in simple peasant style clothing. One of these sets was my inspiration for my Babushka bears. 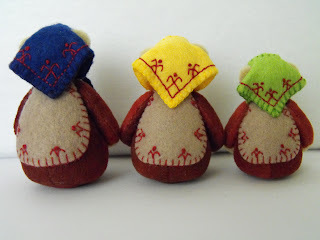 This is the set of 3 Babushkas. I just loved there simplicity (excuse the photo it was taken on my phone). Below is my version ( in bear form ) of these gorgeous girls. Hope you like them they are 2 1/2",2" and 1 1/2"
In case you missed it click on the link further down my page to participate in The Little Leaf blog giveaway he is a beautiful little panda. I know I'm keeping my fingers crossed. aww so cute this is actually my favourite style of russian doll.